3-Sarah May Appleby was born on 20 Jun 1875 in Exton, Tasmania, died on 3 Mar 1926 at age 50, and was buried in Mar 1926 in Presbyterian Cemetery, Chudleigh. 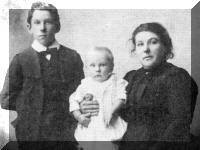 Sarah married Albert Clarence Ashdown, son of Henry William Ashdown and Sarah Ann Pickett, on 26 May 1896 in Wesleyan Church, Gawler River, Tasmania. Albert was born on 23 Jun 1874 in Deloraine, Tasmania, died on 12 Jun 1917 in Tasmania at age 42, and was buried in Jun 1917 in Presbyterian Cemetery, Chudleigh. At the age of 11 Sarah went with the family to live at Chudleigh. It would have been there that she met her future husband, Albert Clarence Ashdown. It was 10 years later when they married at the Gawler River, Wesleyan Church on May 26, 1896 by the minister J. R. Bradbury. After their wedding they went to Chudleigh to live in what was and still is known as the "Old Stone House". This was their home for all their married life. Sarah, like all her sisters was an excellent cook. The old home had a brick oven in which the fire was lit inside the oven and when hot the fire was drawn (drawn — to remove the fire from inside the oven with the aid of a peel). The bread was cooked first, then the cakes and biscuits. She used to know just when it was hot enough. All large roasts of meat would be cooked in a camp oven hanging over the fire next to the oven. The people who now own the "Old Stone House" (1986) are restoring it as it was in the days of Sarah and Clarry. They will have a brick oven as well. During the 1914-18 War Sarah did lots of work for the Red Cross. She saw to the comforts of the soldiers serving overseas. Clarry was a keen cricketer. He was hit on the ankle by a cricket ball which chipped the bone and it in turn decayed. Clarry had to have his foot off and after his leg had healed he made a foot out of dried willow and strapped it to his leg. Clarry still went on ploughing and doing all farm work, he even played cricket again. Clarry served as a councillor on the Deloraine Council (Chudleigh Ward). He was also a local preacher. He used to drive a horse and cart as far as Meander and Parkham on Sunday morning and return at night, sometimes taking more than one service. One could say Clarry gave his life helping others, for it was at a Chudleigh wood day for the poor of Launceston that he ran a splinter into his hand. He died within a few days of tetanus. Sarah and Clarry had five sons. They and their sons Henry and Lenthore all died between the age of 40 and 50 years. Eric the youngest was two months old when his father died and seven when he lost his mother. Frank and Eric are still living (1988). Frank is over 80 and going strong. 4-Wilfred Alfred Ashdown was born on 7 Mar 1897 in Deloraine, Tasmania, died on 3 Aug 1967 in the Launceston General Hospital at age 70, and was buried in Sep 1967 in General Cemetery, Deloraine, Tasmania. Wilfred married Phyllis Sylvia Emily Prewer, daughter of Robert Prewer and Annie Grace Pearn. Phyllis was born on 28 May 1899 in Westbury, Tasmania, died on 29 Oct 1971 in Arcoona Hospital, Deloraine at age 72, and was buried in Oct 1971 in Deloraine Cemetery. 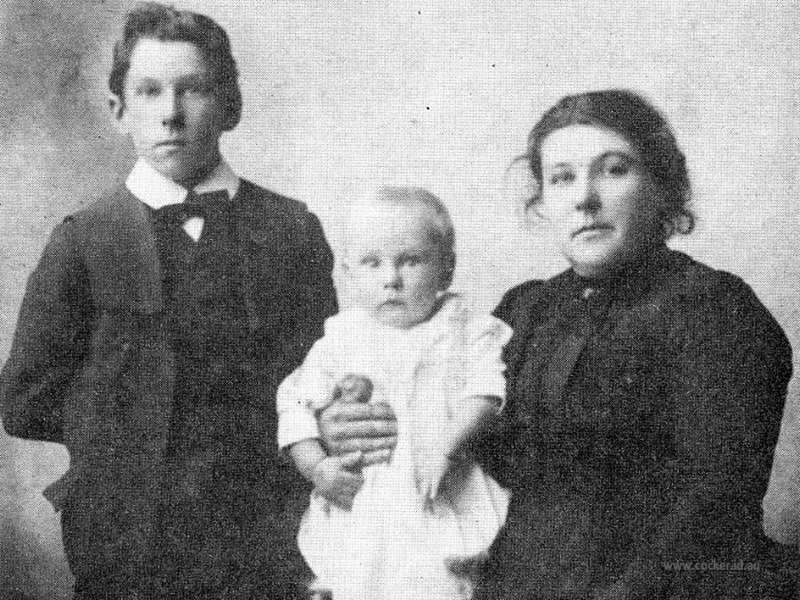 They had two children: Winifred Jean and Jack Wilfred. 5-Winifred Jean Ashdown was born on 17 Aug 1926 in Arcoona Hospital, Deloraine, died on 26 Feb 2007 in Aldersgate Home, Launceston, Tasmania at age 80, and was buried on 1 Mar 2007 in Deloraine Lawn Cemetery. Winifred married John Noel Smyth on 8 Sep 1974 in Methodist Church, Camberwell, Victoria. John was born on 3 Jan 1927 in Ireland, died on 3 Aug 1990 in the Launceston General Hospital at age 63, and was buried in Aug 1990 in Deloraine Lawn Cemetery. 5-Jack Wilfred Ashdown was born on 15 Jun 1932 in Arcoona Hospital, Deloraine. Jack married Rita Farrell. Rita was born on 29 Oct 1938 in Deloraine, Tasmania. They had four children: Philip John, Stuart Charles, Julie Anne and Todd Richard. 6-Philip John Ashdown was born on 28 Nov 1960. 6-Stuart Charles Ashdown was born on 23 Jul 1964. 6-Julie Anne Ashdown was born on 4 Jul 1969. 6-Todd Richard Ashdown was born on 6 Jun 1975. 4-Clarence Frank Ashdown was born on 31 May 1900. Clarence married Edna May Horton. Edna was born on 10 Oct 1906 and died on 19 Oct 1983 at age 77. They had three children: Bruce Clarence, Mervyn Donald William and Jeffrey Frank. 5-Bruce Clarence Ashdown was born on 13 Oct 1928. Bruce married Nancy Faye Creely. Nancy was born on 6 Sep 1934. They had four children: Christine Faye, Janine Nancy, Wayne Bruce and Michael. 6-Christine Faye Ashdown was born on 12 May 1955. Christine married Robert Cyril McMillan. Robert was born on 15 Dec 1953. They had two children: Duane Robert and Nicole Ann. 7-Duane Robert McMillan was born on 26 Nov 1975. 7-Nicole Ann McMillan was born on 14 Nov 1978. 6-Janine Nancy Ashdown was born on 6 Dec 1956. Janine married Geoff Norman Speight. Geoff was born on 10 Jun 1954. They had two children: Adam Geoffrey and Adele Vanessa. 7-Adam Geoffrey Speight was born on 30 Dec 1976. 7-Adele Vanessa Speight was born on 23 Sep 1978. 6-Wayne Bruce Ashdown was born on 1 May 1960. 6-Michael Ashdown was born on 11 Jul 1965. 5-Mervyn Donald William Ashdown was born on 5 Jul 1930 and died on 30 Jun 1982 at age 51. Mervyn married Doreen May Eastley. Doreen was born on 9 Sep 1933. They had one daughter: Marie Elizabeth. 6-Marie Elizabeth Ashdown was born on 12 Dec 1959. Marie married Stephen Denis Lawes. Stephen was born on 9 Nov 1957. They had one daughter: Heley Maree. 7-Heley Maree Lawes was born on 30 Aug 1982. 5-Jeffrey Frank Ashdown was born on 31 May 1936. Jeffrey married Winifred Rae Haberle. Winifred was born on 24 Dec 1939. They had five children: Trudy Louise, Raylene May, Leslie, Grant and Patrina. 6-Trudy Louise Ashdown was born on 18 Oct 1961. 6-Raylene May Ashdown was born on 24 Mar 1963. 6-Leslie Ashdown was born on 23 May 1966. 6-Grant Ashdown was born on 21 Jul 1968. 6-Patrina Ashdown was born on 8 Apr 1977. 4-Henry Ashdown was born on 5 Apr 1903 in Chudleigh, Tasmania and died on 7 Oct 1947 at age 44. Henry married Lillian How. Lillian was born on 11 Sep 1907. They had four children: Malcom, Clarice, Beth and Rosalie. 5-Malcom Ashdown was born on 17 Dec 1930. Malcom married Brenda Haberle. Brenda was born on 6 Dec 1930 and died on 5 Oct 1985 at age 54. They had two children: Peter and Sharon. 6-Peter Ashdown was born on 15 Mar 1953. Peter married Maragret Fox. Maragret was born on 16 Apr 1956. They had two children: Keren and Kristin. 7-Keren Ashdown was born on 15 Jan 1981. 7-Kristin Ashdown was born on 27 Oct 1984. 6-Sharon Ashdown was born on 25 Feb 1960. Sharon married Nathan Leatherbarrow. Nathan was born on 10 Nov 1957. They had two children: Jeremy and Shawn. 7-Jeremy Leatherbarrow was born on 17 Oct 1981. 7-Shawn Leatherbarrow was born on 26 Dec 1983. Malcom next married Beverley Joy Hawley. Beverley was born on 7 Feb 1947. 5-Clarice Ashdown was born on 6 Oct 1933. Clarice married John Lloyd. John was born on 30 Mar 1937. They had four children: Sharon, Dale, Vanessa and Rodney. 6-Sharon Llloyd was born on 1 Apr 1964. 6-Dale Llloyd was born on 26 Apr 1966. 6-Vanessa Llloyd was born on 13 Jun 1967. 6-Rodney Llloyd was born on 26 Jan 1969. 5-Beth Ashdown was born on 9 Mar 1935 and died on 27 Aug 1981 at age 46. Beth married John Polkinghorne. John was born on 16 Mar 1930. They had four children: Debra, Craig, Leree and Karina. 6-Debra Polkinghorne was born on 12 Nov 1962. 6-Craig Polkinghorne was born on 22 Jul 1966. 6-Leree Polkinghorne was born on 14 Apr 1968. 6-Karina Polkinghorne was born on 4 Aug 1973. 5-Rosalie Ashdown was born on 5 May 1942. Rosalie married Michael Knowles. Michael was born on 25 Jan 1940. They had three children: Gregory, Leigh and Craig. 6-Gregory Knowles was born on 19 May 1963. 6-Leigh Knowles was born on 17 May 1965. 6-Craig Knowles was born on 9 Aug 1966. 4-Lenthorne William Ashdown was born on 14 Apr 1907 in Chudleigh, Tasmania, died on 6 Sep 1952 in Devonport at age 45, and was buried in Devonport. Lenthorne married Vanda Lily Keep, daughter of Alfred Ernest Keep and Matilda Grace Kendle, on 14 May 1930 in Fernie Rise, South Spreyton, Tasmania. Vanda was born on 28 Sep 1905 in Fernie Rise, South Spreyton, Tasmania, died on 26 Aug 2001 in Smithton at age 95, and was buried on 28 Aug 2001 in Devonport. They had four children: Athol Clarence, Percy, Ellen and Chloris. 5-Athol Clarence Ashdown was born on 13 Oct 1932, died on 27 Oct 1958 in Devonport at age 26, and was buried on 29 Oct 1958 in Devonport. Another name for Athol was Athol Lenthorne. Athol married Mona Suckling on 27 Oct 1958. Mona was born on 14 Nov 1933. 5-Percy Ashdown was born on 6 Sep 1936 in Deloraine, Tasmania and died on 1 Apr 2011 in Latrobe, Tasmania at age 74. Percy married Heather Duthie. Heather was born on 30 Aug 1940. They had four children: Jennifer, Yvonne, Andrew and Nigel. 6-Jennifer Ashdown was born on 16 May 1964. Jennifer married Graham Rankin. Graham was born on 20 Feb 1963. They had one daughter: Vanessa Louise. 7-Vanessa Louise Rankin was born on 31 Jul 1985. 6-Yvonne Ashdown was born on 25 Jul 1965. 6-Andrew Ashdown was born on 18 May 1967. 6-Nigel Ashdown was born on 4 Mar 1973 and died on 19 Jan 1988 at age 14. 5-Ellen Ashdown was born on 26 Feb 1943. Ellen married Graeme Sherriff. Graeme was born on 28 Jun 1941. They had three children: Annette, Helen and Rodney. 6-Annette Sherriff was born on 26 Jun 1967. 6-Helen Sherriff was born on 9 Dec 1969. 6-Rodney Sherriff was born on 18 Jun 1974. 5-Chloris Ashdown was born on 18 Sep 1944. Chloris married John Gregory. John was born on 27 Jul 1944. 6-Janelle Creedon was born on 27 Aug 1971. 4-Eric Clarence Ashdown was born on 17 Apr 1917 in Deloraine, Tasmania, died in May 1989 at age 72, and was buried on 2 May 1989 in Mersey Vale Memorial Park Lawn Cemetery. He served in the Second World War. Eric married Eileen Jean Stott, daughter of Ronald Headley Stott and Emily Edith East, on 29 Feb 1936 in Deloraine, Tasmania. Eileen was born on 15 Aug 1917, died on 17 Oct 1984 at age 67, and was buried on 19 Oct 1984 in Mersey Vale Memorial Park Lawn Cemetery. They had four children: Ronald Eric, Jean Barbara, Kevin Douglas and Beverley Dawn. 5-Ronald Eric Ashdown was born on 14 Sep 1936. Ronald married June Katherine Donahue. June was born on 19 Oct 1942. They had four children: John Ronald, Rodney Charles, Annette June and Andrea Marie. 6-John Ronald Ashdown was born on 27 Dec 1959. John married Sandra Rosethorn. Sandra was born on 15 Aug 1959. 6-Rodney Charles Ashdown was born on 2 Dec 1961. Rodney married Tina McKendry. Tina was born on 8 Aug 1956. 6-Annette June Ashdown was born on 24 Jun 1966. Annette married Barry Raymond Parsons. Barry was born on 10 Oct 1961. 6-Andrea Marie Ashdown was born on 5 Mar 1980. 5-Jean Barbara Ashdown was born on 26 Jun 1938. Jean married Geoff Charleston. Geoff was born on 21 Dec 1934. They had five children: Debbie, Michael, Diana, Dale and Melissa. 6-Debbie Charleston was born on 6 May 1957. Debbie married Douglas Osborne. Douglas was born on 29 Oct 1954. They had three children: Andrew, Nicolle and Lee. 7-Andrew Osborne was born on 26 Nov 1974. 7-Nicolle Osborne was born on 18 Nov 1978. 7-Lee Osborne was born on 19 Oct 1982. 6-Michael Charleston was born on 13 Jan 1959. Michael married Fiona Angus. Fiona was born on 29 Apr 1963. They had two children: Steven and Sarah. 7-Steven Charleston was born on 15 Oct 1982. 7-Sarah Charleston was born on 10 May 1984. 6-Diana Charleston was born on 26 Jun 1961. Diana married Tony Craddock. Tony was born on 10 Jun 1958. 6-Dale Charleston was born on 10 Sep 1962. Dale married Mandy Carey. Mandy was born in 1963. 6-Melissa Charleston was born on 4 Feb 1974. 5-Kevin Douglas Ashdown was born on 26 Oct 1939, died on 19 May 2007 in District Hospital, Deloraine, Tasmania at age 67, and was buried on 23 May 2007 in Hagley, Tasmania. Kevin married Lorraine Scott. Lorraine was born on 16 Sep 1941. They had one daughter: Kim. 6-Kim Ashdown was born on 27 Dec 1961. Kim married Colin Jones. Colin was born on 23 Aug 1954. 5-Beverley Dawn Ashdown was born on 29 Jun 1948. Beverley married John Gordon Reid. John was born on 24 May 1938. They had three children: Cindy Eileen, Maree Anne and John Eric. 6-Cindy Eileen Reid was born on 12 Oct 1965. 6-Maree Anne Reid was born on 27 Apr 1968. 6-John Eric Reid was born on 20 Feb 1972.